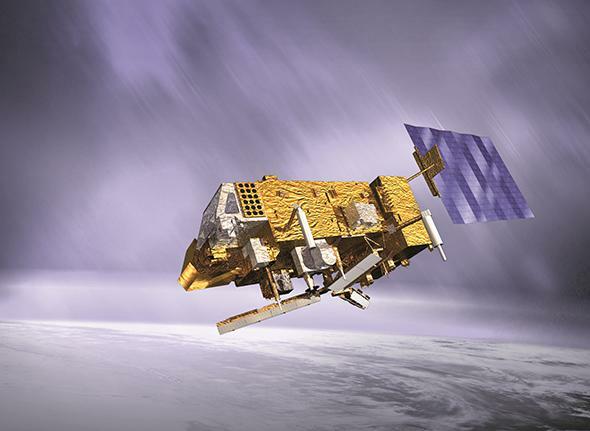 Climate scientists show that satellites are not the best way to measure global warming. The MetOp-B satellite, one of many that use microwaves to measure the Earth’s temperature. During the hearing, Cruz said a lot of completely false things, but two things he hammered over and again were the reliability of satellite data, and how those data don’t show any warming over the past 18 years*—the so-called pause. As I’ve written many times, that “pause” doesn’t exist; we’re still getting warmer and have been for decades. He cherry-picked the data, looking only as far back as 1998, when a huge spike in temperature due to an El Niño event made it look like temperatures are flat since then (when you start high, it makes the rest of the graph look flatter). That’s hugely misleading, of course. I don’t wanna bash them, because everybody makes mistakes, and I’m gonna presume everybody’s being honest. But I would just point out that, imagine the howls you would get if climate models predicted it was warmer at night than during the day. You would hear people on the other side just screaming bloody murder: “How can you believe this, these people are incompetent, how can you possibly believe the model that has this wrong sign of the diurnal cycle in it. The physics is obviously all screwed up”. […] It goes to show you the amount of confirmation bias going on in this debate. […] These people accept the satellite data completely uncritically, because it tells them what they want to hear. I’m sure many people who deny global warming and/or its effects and immediacy honestly believe what they’re saying is true, but for some of the others that honesty is difficult to grant. Dr. Dessler is a generous man. The bottom line: You can’t cherry-pick when you start the temperature measurements, and you can’t cherry-pick the data sets themselves, even—especially—if they show what you want. Despite the claims of people like Roy Spencer (yes, this Roy Spencer); Ted Cruz; Lamar Smith, R-Texas; and James Inhofe, R-Oklahoma, we know the Earth is warming up, and we know humans are the reason why. *Correction, Jan. 14, 2016: This post originally misspelled Andrew Dessler’s last name.